As YVR grows into a world-class sustainable hub airport, travellers can look forward to more than 30 new food-and-beverage and retail options opening, including many first-time concepts to YVR. The new offerings, some of which will open as early as summer 2019, will complement the airport’s existing award-winning portfolio of more than 170 shops, services and restaurants located before and after security. Hawksworth Kitchen—In 2020, internationally renowned Canadian chef, David Hawksworth, will open his first airport location in the Domestic Terminal. Taking inspiration from his celebrated Hawksworth and Nightingale restaurants, the traveller-friendly menu will feature farm-fresh dishes that include organic salads, oven-fired pizzas, house pastas and cured meats. The Dirty Apron—This award-winning, chef-driven hometown deli will serve freshly baked breads, locally sourced seasonal produce and meats sourced from regional producers. Steamworks Bar & Restaurant, Whistler Brewing Lodge and Red Truck Beer Stop developed in conjunction with Red Truck Beer Co—These will add to YVR’s artisanal craft beer scene, while also delivering a mix of traditional mountain cuisine and hearty, brewpub fare. Other additions include Heritage Asian Eatery, which specializes in contemporary Asian comfort food, Left Coast Café & Bar and BUILT Custom Burgers. For those heading off to the U.S., Wahlburgers will round out the offering with concepts that appeal to a range of local and international travellers. 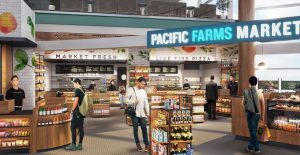 Tastes on the Fly, a boutique airport restaurant operator headquartered in San Francisco and creator of the award-winning Napa Farms Market, is bringing a local marketplace concept to YVR—Pacific Farms Market. Inspired by British Columbia’s vibrant and high-quality food scene, this concept will be operated in both the Domestic and International terminals. The International terminal food market will be anchored with five made-to-order food stations including a grab-and-go section with 49th Parallel, one of Vancouver’s favourite coffee purveyors, and a selection of baked on-site goods from Purebread Bakery; a Market Fresh station with a breakfast bar in the morning and freshly made entrees, soups and other goods in the afternoons and evenings; a sushi-and-poke station serving the freshest regional fish; Live Fire Pizza with artisan, hand-made, oven-fired pizzas and a juice bar with freshly squeezed juices and smoothies. The International terminal market will be flanked by a full-service restaurant and bar featuring a seafood-inspired menu offering the best of fresh, local catches. Several independent operators will add to the portfolio with a variety of on-the-go options including Coastal Coffee, Subway and Japadog. Additional retail options will include Paradies Lagardère, a travel retail leader in North America, which will be introducing the internationally renowned travel essential brand Relay, as well as three Vancouver-inspired travel essentials concepts. Accompanying Relay will be a full-service illy Café, which will feature a wide variety of authentic Italian coffee, pastries and other on-the-go treats. 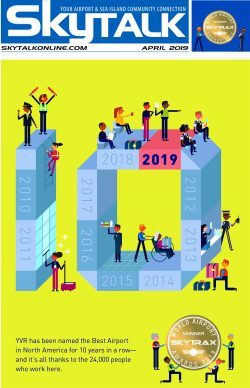 As one of North America’s leading hubs, YVR provides convenient connections to destinations in Canada, the United States, Asia, Europe and the Americas and has received the Skytrax award for Best Airport in North America for a record eight years in a row.